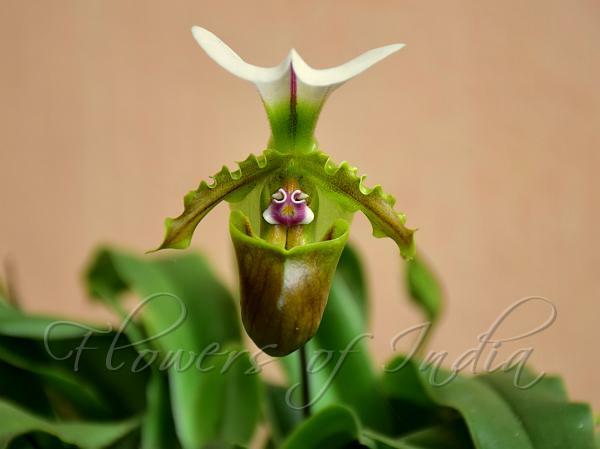 Spicer's Slipper Orchid is a small sized, terrrestrial orchid which is sometimes found growing on rocks. It has 5 oblong, clear, dull green leaves that are speckled purple on the outer surface towards the base. It blooms from autumn through winter on an erect, 1 to successively and rarely 2, slender, purple, 20-40 cm long inflorescence with ovate, acute bracts. Flowers are 5-7 cm wide; dorsal sepal white with a maroon midvein and greenish base; synsepal yellowish green or whitish green; petals yellowish green with a brown-purple midvein and many paler speckles along lateral veins; lip pale green-brown or pale yellow-brown with dark brown veins; staminode white with a large purple circle centrally. Dorsal sepal curving forward, broadly ovate-round or nearly round, 2.8-4.9 × 3.2-4.1 cm, both surfaces finely velvet-hairy, basal margin recurved, minutely fringed with hairs, blunt to rounded at tip; synsepal ovate, 2.5-4 × 1.4-3 cm, finely velvet-hairy on both surfaces or becoming hairless above, blunt at tip. Petals are linear-spoon-shaped or narrowly oblong, 2.6-5.2 × 0.6-1.8 cm, above white hairy at base, margin wavy, tip rounded or blunt; lip helmet-shaped, 3.2-3.9 cm; pouch 3-3.8 × 1.8-2.8 cm. Staminode obovate or obovate-nearly round, 9-10 × 6-7 mm, convolute on basal margin and appearing like a pair of eyes, blunt-pointed at tip. 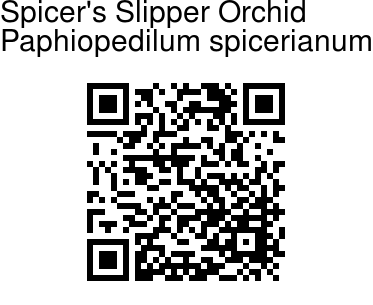 Spicer's Slipper Orchid is found in Eastern Himalayas, at altitudes of 900-1400 m. Flowering: September-November.